Sinclair is thrilled to welcome Temple Grandin, Ph.D. to the downtown and Centerville campuses on Thursday, March 21, 2019. 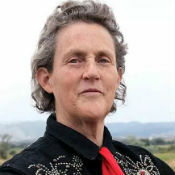 A celebrated authority on autism, based on her personal experiences and lifelong study, Dr. Grandin will speak on Educating Students Who Have Different Kinds of Minds. She will meet with students and faculty at 3:00 p.m. in Building 12, Room 12-116 and speak at a public event at 5:30 p.m. in the auditorium at the Centerville Learning Center, 5800 Clyo Road. This event is free. Seating is first come, first serve. For more information, contact michael.carter@sinclair.edu. This event is sponsored by the Sinclair Diversity Office.